As we enter the summer high season when many are planning to jet off to luxury villa rentals in St. Tropez or Capri, it’s important to start thinking ahead to winter plans. Luxury villa rentals of the calibre offered by Villazzo–many complete with customized five-star VillaHotel amenities and services–are few and far between and book up fast. While it may seem premature to be talking about December’s Art Basel in Miami when the Venice Biennale just kicked off, if you’re planning to attend you should start thinking about booking your accommodations now to avoid being disappointed. While Miami is famous for sun and sand, gorgeous vistas and raucous parties, it is also becoming quite the mecca for art in North America. Indeed, Art Basel in Miami Beach is arguably the most prestigious art show in the United States. 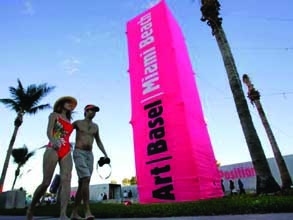 The sister of the original Art Basel in Switzerland, the Miami version is held in the city’s Art Deco District. Perfect, too, if you’re a sun lover as the exhibition spaces are located quite close to the beach. Art Basel Miami 2011 is being held from December 1st to the 4th and will feature “an exclusive selection of more than 250 leading art galleries from North America, Latin America, Europe, Asia and Africa [that] will exhibit 20th and 21st century artworks by over 2,000 artists. The exhibiting galleries are among the world’s most respected art dealers, offering exceptional pieces by both renowned artists and cutting-edge newcomers.” Visit artbaselmiamibeach.com for more information. You are currently browsing the Luxury Home Rentals in Miami, Aspen & St. Tropez – Villazzo blog archives for June, 2011.